A Manchester City fan has revealed how doctors told him he was close to death after being attacked following the club's Champions League win in Schalke. Paul Worth, from Urmston in Greater Manchester, was struck over the head after a violent confrontation with two Schalke supporters on 20 February. He was left in a coma and remained in a German hospital until last week. "I've had staples in the back of my head, my jaw rewired and lost a tooth," the 32-year-old posted on Facebook. In a post in which he thanked the support of fans, Mr Worth said he "could barely walk" when he was transferred to Salford Royal last week. "Now I can walk up and down stairs and make tea and toast as part of my therapy," he added. "I don't remember the actual incident. I just remember waking up in an ICU unit in Germany and the doctors and nurses were telling me how close I was actually to death." Mr Worth had travelled to Germany with his family for the club's 3-2 win in the first leg of the last-16 tie. Those with him said he could not talk when he woke from his coma. The City supporter now says he faces a "long process" of physio and therapy and was due to receive results from a CT scan on Wednesday. "Thank you from the bottom of my heart to all the people that are showing concern and also helping my family out during this time," he added. 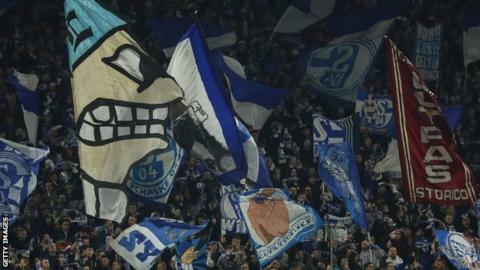 A 30-year-old man was arrested by Gelsenkirchen police after the incident and police said he was a member of the Schalke "ultras". City thrashed Schalke 7-0 in the second leg of the tie and now face Tottenham in the quarter-finals, with the first leg on 9 April.